With the Tour de France starting tomorrow (1 July), I thought I would post a random collection of stories from my RSS reader. Finally, OLN has coverage of the Tour de France in America. Here is a link to a blog of some people who took a trip to vietnam. They blogged about it, took video, etc…. I haven't read but snippets yet, but I plan to later on. Well…I am happy to report yet another day with no morning/all day sickness!! That makes 4 days in a row..whoo hoo :^) I've been able to mostly set aside my saltines and ginger snaps, which has been a relief. Ginger snaps, especially, have been very helpful…but you can only eat so many! This past week has been a good one with the kids at work, and all the teachers and parents have been so sweet and encouraging about the baby. It's such a blessing to know that you have a group of people praying for you and ready to help you through this amazing experience. Although the help I really need these days involves some extra nap time! As much as I'll miss the kids, I'm looking forward to the end of next week. After that Friday, I'll be off for a while and can enjoy some much-needed down time. I know I'd better enjoy it while I can, because after January…there won't be any for a long time!! Well, as Cyndi mentioned, we went to the Dr. today. 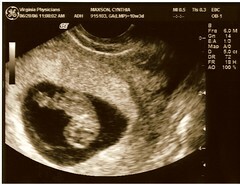 Part of the visit was getting some ultrasound pictures of the baby done. We decided to put them online to share them with everyone. 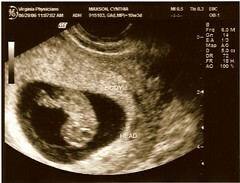 If you want to see them in detail, visit the gallery for the July 28, 2006 ultrasound pictures. 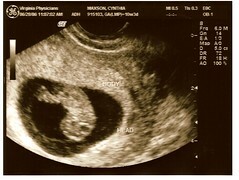 We are sooo blessed! Today was our very first baby visit! It was a little overwhelming, but mostly very neat. Dr. Royal is very nice and I felt really comfortable with her. Matt was a trooper…hanging out with me the whole time. 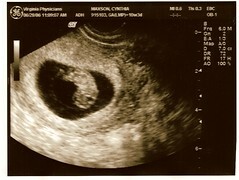 The best part was definitely getting to see the baby and hear the heartbeat!! Little One waved his/her arm buds at us and seemed happy to "smile" for the camera. 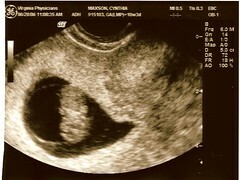 We'll be posting the ultrasound pics shortly. The rest of the visit was pretty straightforward: meet/greet, question/answer, poke/prod…Dr. Royal is easy-going and easy to talk to, so I'm looking forward to future visits. 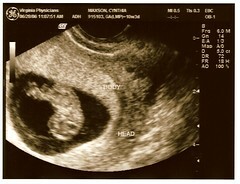 My next appointment is August 1, at which point I'll be 14 weeks. I get pretty nervous/excited about stuff, so my blood pressure was a little elevated (white coat hypertension), but other than that everything was great! I even got a bag of goodies (books, pamphlets, coupons, etc.). We were a little concerned about some insurance stuff, but a quick phone call relieved those anxieties. After some relatively minor copays, everything else is covered 100%…Praise the Lord!! I thought I would post an image of my bike ride Saturday. It was the longest ride of the season so far, but very good. All it did was get me in the mood to ride some more. For stats of the ride, refer to my June 2006 Bike Stats page. If you want to see a larger image of the ride, click the small thumbnail image below.